Today marks Kurt Gödel's one hundred and eleventh birthday. 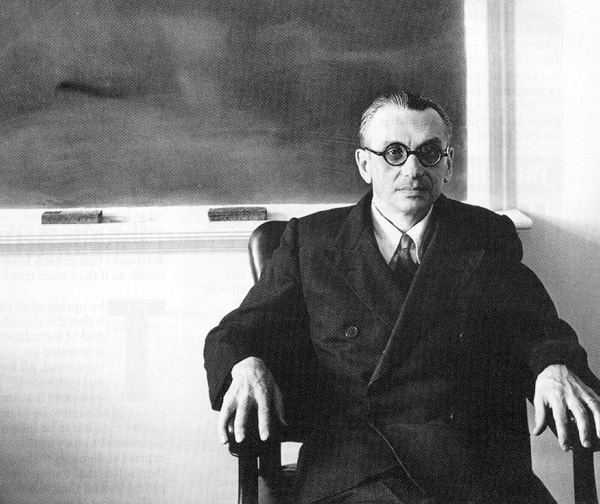 Along with Aristotle, Gödel is often considered the greatest logician in history. But I believe his influence goes much farther. In an age when both science and politics seem to be riddled with an incessant search for "truth" - often truth that aligns with one's preconceived social or political opinions - Gödel's work is a useful antidote and a powerful reminder against the illusion of certainty. Gödel was born in 1906 in Brünn, Czechoslovakia, at a time when the Austro-Hungarian empire was at its artistic, philosophical and scientific peak. Many of Gödel's contemporaries, including Ludwig Wittgenstein, distinguished themselves in the world of the intellect during this period. Gödel was born to middle class parents and imbibed the intellectual milieu of the times. It was an idyllic time, spent in cafes and lecture halls learning the latest theories in physics and mathematics and pondering the art of Klimt and the psychological theories of Freud. There had not been a major European conflict for almost a hundred years. In his late teens Gödel came to Vienna and became part of the Vienna Circle, a group of intellectuals who met weekly to discuss the foundations of philosophy and science. The guiding principle of the circle was the philosophy of logical positivism which said that only statements about the natural world that can be verified should be accepted as true. The group was strongly influenced by both Bertrand Russell and Ludwig Wittgenstein, neither of whom was formally a member. The philosopher Karl Popper, whose thinking on falsification even now is an influential part of science, ran circles around the group, although his love for them seems to be unreciprocated. It was at the tender age of 25 that young Gödel published his famous incompleteness theorem. He did this as part of his PhD dissertation, making that dissertation one of the most famous in history (as a rule, even most famous scientists don't always do groundbreaking work in graduate school). In a mere twenty-one pages, Gödel overturned the foundations of mathematics and created an edifice that sent out tendrils not just in mathematics but in the humanities, including psychology and philosophy. To appreciate what Gödel did, it's useful to take a look at what leading mathematicians thought about mathematics until that time. Both Bertrand Russell and the great mathematician David Hilbert had pursued the foundations of mathematics with conviction. In a famous address given in 1900, Hilbert had laid out what he thought were the outstanding problems in mathematics. Perhaps none of these was as important as the overarching goal of proving that mathematics was both consistent and complete. Consistency means that there exists no statement in mathematics that is both true and false at the same time. Completeness means that mathematics should be capable of proving the truth or falsity (the "truth value") of every single statement that it can possibly make. In some sense, what Hilbert was seeking was a complete "axiomatization" of mathematics. In a perfectly axiomatized mathematical system, you would start with a few statements that would be taken as true, and beginning with these statements, you would essentially have an algorithm that would allow you derive every possible statement in the system, along with their truth value. The axiomatization of mathematics was not a new concept; it had been pioneered by Euclid in his famous text of geometry, "The Elements". But Hilbert wanted to do this for all of mathematics. Bertrand Russell had similar dreams. In one fell swoop the 25-year-old Gödel shattered this fond hope. His first incompleteness theorem, which is the most well-known, proved that any mathematical system which is capable of proving the basic theorems of arithmetic is always going to include statements whose truth value cannot be proved using the axioms of the system. You could always 'enlarge' the system and prove the truth value in the new system, but then the new, enlarged system itself would contain statements which succumbed to Gödel's theorem. What Gödel thus showed is that mathematics will always be undecidable. It was a remarkable result, one of the deepest in the annals of pure thought, striking at the heart of the beautiful foundation built by mathematicians ranging from Euclid to Riemann over the previous two thousand years. Gödel's theorems had very far-reaching implications; in mathematics, in philosophy and in human thought in general. One of those momentous implications was worked out by Alan Turing when he proved a similar theorem for computers, addressing a problem called the "halting problem". Similar to Hilbert's hope for the axiomatization of mathematics, the hope for computation was that, given an input and a computer program, you could always find out whether the program would halt. Turing proved that you could not decide this for an arbitrary program and an arbitrary input (although you can certainly do this for specific programs). In the process Turing also clarified our definitions of "computer" and "algorithm" and came up with a universal "Turing machine" which embodies a mathematical model of computation. Gödel's theorems were thus what inspired Turing's pioneering work on the foundations of computer science. Like many mathematicians who make seminal contributions in their twenties, Gödel produced nothing of comparable value later in his life. He migrated to the US in the 1930s and settled down at the Institute for Advanced Study in Princeton. There he made a new friend - Albert Einstein. 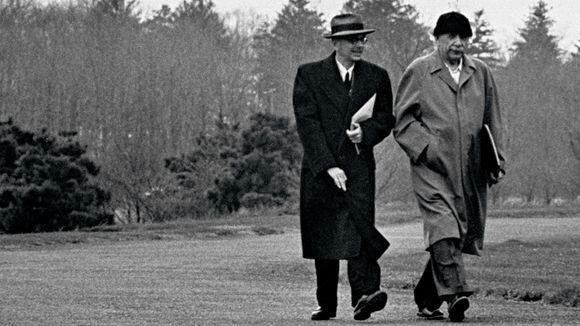 From then until Einstein's death in 1955, the sight of the two walking from their homes to the institute and back, often mumbling in German, became a town fixture. Einstein afforded the privilege of being his walking companion to no one, and seemed to have considered only Gödel as his intellectual equal: in fact he held Gödel in such esteem that he was known to have said in his later years that his own work did not mean much to him, and the main reason he went to work was to have the privilege of walking home with Gödel. At least once Gödel startled his friend with a scientific insight he had: he showed using Einstein's own field equations of gravitation that time travel could be possible. Sadly, like a few other mathematical geniuses, Gödel was also riddled with mental health problems and idiosyncrasies that got worse as he grew older. He famously tried to find holes in the U.S. Constitution while taking his citizenship exam, and Einstein who accompanied him to the exam had to talk him out of trying to demonstrate to the judge how the U.S. could be turned into a dictatorship (nowadays some people have similar fears, but for different reasons). After Einstein died Gödel lost his one friend in the institute. Since early childhood he had always been a hypochondriac - often he could be seen dressed in a warm sweater and scarf even in the balmy Princeton summer - and now his paranoia about his health greatly grew. He started suspecting that his food was poisoned, and refused to accept anything not cooked by his protective wife Adele; in 1930s Vienna she had once physically protected him from Nazis, and now she was protecting him from imagined germs. When Adele was hospitalized with an illness, Kurt stopped eating completely. All attempts to soothe his fears failed, and on January 14, 1978 he died in Princeton Hospital, weighing only 65 pounds and essentially succumbing to starvation. Somehow this sublimely rational, austere man had fallen prey to a messy, frightful, irrational paranoia; how these two contradictory aspects of his faculties conspired to doom him is a conundrum that will remain undecidable. He left us a powerful legacy. What Gödel's theorems demonstrated was that not only the world of fickle human beings but also the world of supposedly crystal-clear mathematics is, in a very deep sense, unknowable and inexhaustible. Along with Heisenberg's uncertainty principle, Gödel's theorems showed us that all attempts at grasping ultimate truths are bound to fail. More than almost anyone else, Gödel contributed to the fall of man from his privileged, all-knowing position. We see his undecidability in politics and human affairs, but it is true even in the world of numbers and watertight theorems. Sadly we seem to have accepted uncertainty in mathematics while we keep on denying it in our own lives. From political demagogues to ordinary people, the world keeps getting ensnared in passionate attempts to capture and declare absolute truth. The fact that even mathematics cannot achieve this goal should give us pause. It should inculcate a sense of wonder and humility in the face of our own fallibility, and should lead us to revel in the basic undecidability of an open world, a world without end, Kurt Gödel's world.